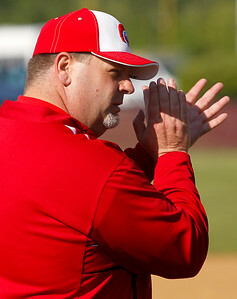 Matthew Apgar - mapgar@shawmedia.com New head coach Tom Kruse claps for Marian Central during their baseball game against Richmond-Burton on Thursday, May 21, 2015 at Richmond-Burton High School in Richmond. Richmond-Burton won the game 9-6. 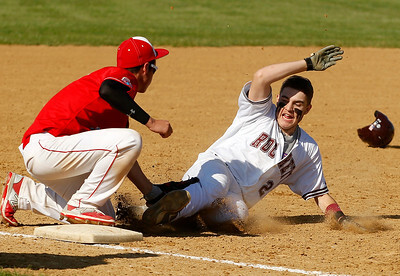 Matthew Apgar - mapgar@shawmedia.com Richmond-Burton's Cody DeLucia is tagged out at third base by Marian Central's Peter Kolner during their baseball game on Thursday, May 21, 2015 at Richmond-Burton High School in Richmond. Richmond-Burton won the game 9-6. Matthew Apgar - mapgar@shawmedia.com New Marian Central head coach Tom Kruse talks with a player during their baseball game against Richmond-Burton on Thursday, May 21, 2015 at Richmond-Burton High School in Richmond. Richmond-Burton won the game 9-6. Matthew Apgar - mapgar@shawmedia.com Richmond-Burton pitcher Joe Dittmar fires a pitch to a Marian Central batter during their baseball game on Thursday, May 21, 2015 at Richmond-Burton High School in Richmond. Richmond-Burton won the game 9-6. 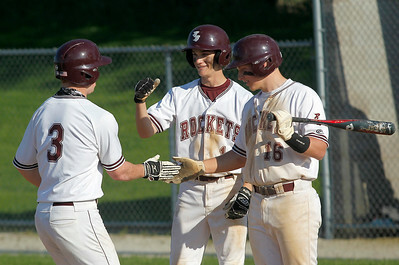 Matthew Apgar - mapgar@shawmedia.com Richmond-Burton's Joe Dittmar, left, is welcomed at home by teammates Jake Rosing, center, and Trevor Anderson, right, after Dittmar hit a home run against Marian Central during their baseball game on Thursday, May 21, 2015 at Richmond-Burton High School in Richmond. Richmond-Burton won the game 9-6. 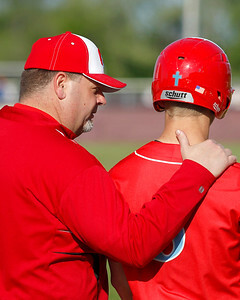 New Marian Central head coach Tom Kruse talks with a player during their baseball game against Richmond-Burton on Thursday, May 21, 2015 at Richmond-Burton High School in Richmond. Richmond-Burton won the game 9-6.